ACCSP was established by its founding members as a committee-based organization. Committees, composed primarily of representatives from the partners, provide the framework for the collaborative processes that create and manage the data standards and govern the Program. The ACCSP Coordinating Council is the governing body of the Program and oversees program design and implementation. The policies set by the Council guide the Program and each partner's participation in it. Membership is composed of one voting member from each of the ACCSP's 23 state and federal partners. Coordinating Council members represent the policy-level of their respective agencies. The Executive Committee, a subset of the Coordinating Council, meets bimonthly to ensure timely decisions are made about the Program. 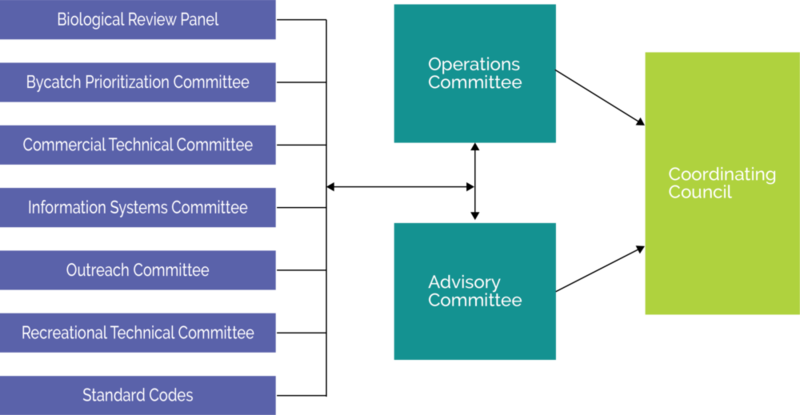 The Operations Committee serves as the steering committee to direct development of program standards and assimilate information from the various committees into cohesive recommendations to the Coordinating Council. By providing recommendations to the Coordinating Council, the Operations Committee guides the development of program standards and serves as the review body for annual project funding priorities. The Committee, along with the Advisory Committee, reviews and prioritizes project proposals with funding recommendations forwarded to the Coordinating Council. The Advisory Committee was established to ensure, to the greatest extent practicable, that the fishing industry perspective is considered in the development and implementation of the Program. The Advisory Committee includes representatives from the commercial, recreational, for-hire, and academic sectors and serves an important role by providing recommendations to the Program. At least one member of this Committee also sits on each technical committee to provide industry feedback. The Committee also reviews and prioritizes project proposals with funding recommendations forwarded to the Coordinating Council. Please review the Advisors Guidelines if you are interested in learning more about the nomination process. A nomination form can be found here. The Biological Review Panel is composed of stock assessment biologists, field supervisory personnel, and industry advisors appointed by partner agencies. The Panel develops ACCSP strategies and standards to obtain and manage biological data. Biological data includes length distributions, collection of aging structures, and tissue for basic life history research. The Panel biennially recommends target species, compiles sampling levels for biological sampling, and works with the Bycatch Prioritization Committee to integrate data collection protocols. The Bycatch Prioritization Committee is composed of stock assessment biologists, observer personnel and protected species experts from partner agencies. The Committee develops ACCSP strategies and standards to collect and manage bycatch and protected species data. These data include at-sea and port discards and information on protected species interactions. The Bycatch Prioritization Committee biennially ranks fleets for funding priority based on fleet characteristics and stock assessment and management needs. The Commercial Technical Committee is composed of a variety of ACCSP partner personnel with hands-on experience implementing and conducting partner commercial fisheries statistics programs. The committee develops catch and effort data collection standards for all species commercially harvested on the Atlantic coast. The Information Systems Committee is composed of both developers and industry representatives implementing and using electronic data collection programs for commercial fisheries. The members identify software applications that can meet reporting needs and develop recommendations to improve SAFIS, a real-time web-based reporting system for seafood dealers. The Recreational Technical Committee is composed of partner personnel who specialize in survey design, statistical estimation of fishing effort, catch, participation, and operation of recreational sampling programs. The committee develops data collection standards for monitoring catch and effort of recreational and for-hire fisheries. They also serve as the coordination body for the partners to develop regional guidance on recreational projects, including the Atlantic Regional Implementation Plan and MRIP survey components. The Standard Codes Committee works to develop and maintain standardized codes for Atlantic fisheries data.